Amazon.com description: Product Description: Research shows that people cannot reach their full potential unless they are in healthy connection with others. Dr. Amy Banks teaches us how to rewire our brains for healthier relationships and happier, more fulfillingÂ lives. We all experience moments when we feel isolated and alone. A 2006 Purdue University study found that twenty-five percent of Americans cannot name a single person they feel close to. Yet every single one of us is hardwired for close relationships.Â The key to more satisfying relationshipsâbe it with a significant other, a family member, or a colleagueâis to strengthen the neural pathways in our brains that encourage closeness and connection. In this groundbreaking book, Dr. Banks give us a road map for developing the four distinct neural pathways in the brain that underlie the four most important ingredients for close relationships:Â calmness, acceptance, emotional resonance, and energy. 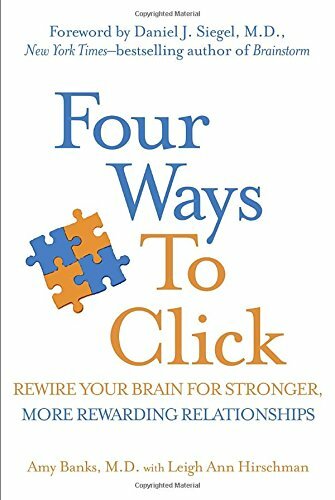 Four Ways to Click gives you the tools you need to strengthen the parts of your brain that encourage connection and to heal the neural damage that disconnection can cause. About: Research shows that people cannot reach their full potential unless they are in healthy connection with others.